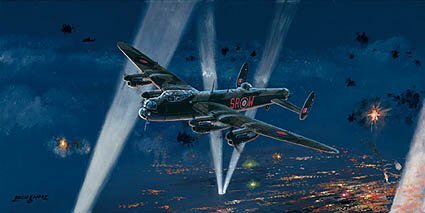 Having completed yet another sortie the crew of 101 Squadron Special Operations Lancaster SR-W, piloted by Flt. Lt. Rusty Waughman, are about to commence the long and hazardous journey back to their base at Ludford Magna, Lincolnshire. All are signed by the artist, Rusty Waughman and four members of his crew. Please see below for details of the signatories of this edition. . All these men regularly flew together in the aircraft depicted. At the time of publishing (October 2002), a further crew member is living in Canada, another lives in Andorra and one is deceased. These Special Duties aircraft carried eight crew. Sergeant Idris (Taff) Arndell (Mid-upper gunner) volunteered for Air Crew at age 17 and was called up just before his eighteenth birthday for Wireless Operator and air gunnery training. Later joined No. 101 Squadron serving with “Rusty” Waughman (see below) and sharing in at least two near fatal mid-air incidents. Idris went on to fly with Wg. Cdr. Alexander on the last of the “Battle of Berlin” missions, completing his tour on 4th June 1944. He later returned to operational duties, including the “Manna” relief drops and the last raid over Bertesgarten. Squadron Leader Alexander (Alec) Cowan (Navigator) joined the RAF in 1941 and qualified as a navigator in December 1942 after training in the USA and Canada. He joined “Rusty” Waughman’s crew in July 1943 and completed his tour of operations with him on No 101 Squadron in June 1944. A subsequent posting to Transport Command led to many years spent flying around the world. He retired from the RAF in 1977 after a service career spent mostly on flying, examining and instructional duties. Sergeant E H (Ted) Manners (Special Duties Officer) volunteered for Air Crew duties in the RAF in November 1942 and trained as an Air Gunner in the Isle of Man. He volunteered for Special Duties whilst at 14 OTU and joined 101 Squadron in November 1942 completing a tour of 30 operations with P/O Waughman and crew on 31st May 1944, aged 19. He was commissioned on leaving the Squadron and after a period as a Gunnery Instructor he joined a new crew as an Air Gunner and was destined to join Tiger Force in the Far East when the war ended. With the cessation of hostilities he transferred to the Intelligence Branch and serve in Egypt, Italy and Austria. He was demobbed in July 1947. W/O J Ormerod DFM “Curly” (Flight Engineer) joined up on 14 August 1942 as a mechanic. He became Flight Engineer and flew with Sgt Zanchi of 101 Sqd, completing two trips with him, before going on leave. On returning from leave, he found out that his crew were missing on a Berlin op, so he became a spare Engineer. He flew eight trips on Berlin with six different pilots and then joined Rusty Waughman’s crew and finished his tour with them. (Seven out of the eight crew are still alive). When the war was over “Curly” flew on “York” A/C from Lyneham RAF (511 Sqd) to the Far East until September 1946.